The presence of total coliform bacteria in aquatic environments indicates that the water has been contaminated by man and animals. The test strips check for “aeobic bacteria” by incubating sampled bactria on growth media. The media grows broad populations of bacteria, and not just specific types like in more sophisticated lab tests. The scale “relates” to viable bacteria (ones that are alive and healthy enough to grow) called Colony Forming Units (CFU). But since we cannot actually count the bacteria without expensive equipment and training, this test strip correlates the change in media color. 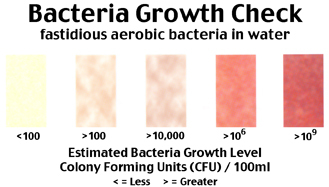 As the color change relates to beginning concentration of aerobic bacteria CFU’s x10(n), the scale was developed based on increasing color coming from increasing numbers of colony forming units (CFU) . Bacteria Growth Check tests only a small water sample and requires a significant quantity of bacteria to show a change on the test pad. Incubate at room temperature for 48 hours. Background information on this test # 180 Bacteria Growth Check Water Test PDF is available as a PDF download.